Components of FastCube.Net. Part 2. Chart, ChartToolbar, DataSource, DBDataSet, DTDataSet. - Fast Reports Inc. Components of FastCube.Net. Part 2. Chart, ChartToolbar, DataSource, DBDataSet, DTDataSet. In the first part of the article, we looked at the components for data analysis - a cube and a slice. In the second section, the components from the database or DataTable will be presented, as well as the slice diagram. 1. The Chart component is a graph based on the data from the slice. It is built automatically, just set the property of Slice. Axis of the series. Contains columns and lines. Axis of categories. Contains columns and lines. The way data is presented in the diagram. Setting the Chart component is to select the available slice in the Slice property. In this case, we need to create an object, configure its display, bind to the parent object, and specify the slice. 2. The ChartToolbar component contains tools for customizing the chart display. 6) Copy - copy the diagram as a picture. When setting up the visual component, you need to set the Chart property, which is the chart to which the toolbar will be attached. 3. The DataSource component is the data source for the cube. In the settings of this component, you need to define a data set. This can be a DBDataSet or a DTDataSet. Below, for the listed components, the configuration from the application code of the entire data acquisition chain will be shown. 4. DBDataSet - a data set for the DataSource, obtained from the database. 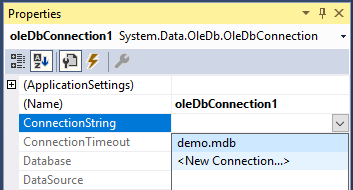 To configure a data connection via DBSataSet, you need to generate DBCommand using the oleDBCommand component. 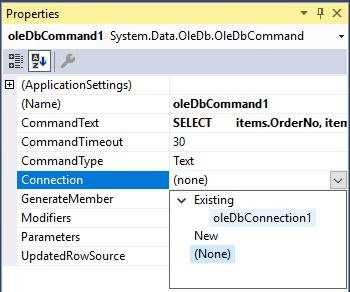 In turn, for the oleDBCommand component, you must specify a connection to the database using the oleDBConnection component. You should specify the command - sql query. And also, you need to select a data connection. 5. DTDataSet is the data set for the DataSource that is received from the DataTable. 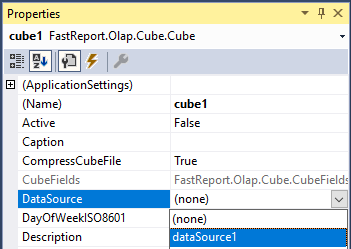 In turn, DataTable can be filled with data from the database, text file, application code. 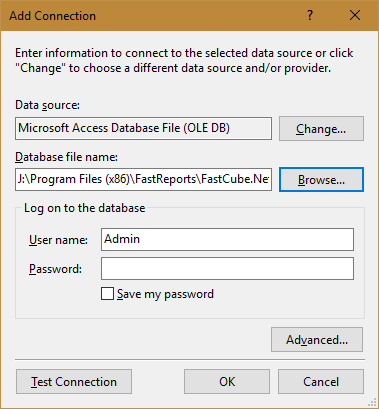 The procedure for setting up a connection to the DataTable using visual components is very simple. 1) Setting up visual components is similar to setting up a database connection, the only difference is that in the DataSet configuration for the DataSource component, you need to select dtDataSet1. Accordingly, oleDBConnection and oleDBCommand are not required.